Are you a new DM looking for players? So, you are a new DM with a wonderful idea for a campaign. You’ve got it all planned out, down to the one liners your bad guy will throw at your players in their final, epic encounter. Unfortunately, you’ve got no players to play with. Boo-hoo. What do you do? Go back to kill the respawning orcs and finish the endless repeating quests in Warcraft? No way! You find yourself some players. The first place you have to go to is your local gaming store. There, you’ll surely find a bunch of like minded gamers ready to take on whatever you’ve got to throw at them. The drawback of this, for guys my age… (ahem, ahh… over… 30…) is that a lot of kids tend to hang out there playing their Yugioh’s and what not. 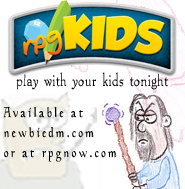 You don’t want to look creepy coming on to a bunch of kids asking them to play D&D with you… Approach kids at your own risk! Second, and this may seem weird but it can work, is to hang out at your local Border’s or Barnes and Noble, and scope out the D&D section. Take a look at the characters browsing the books, and if one seems like a friendly dude, approach him. Chances are he’d jump at the chance to play, or may invite you into his group after a casual conversation. Gamers are friendly for the most part. Your last option is to jump online. There are a countless number of resources online meant to connect players, both face to face and electronically. I will not review or claim to use them, I’ll just provide the links and let you all figure it out for yourselves. Some are portals and some are message boards. If you’ve got other resources, drop me a line or post a message with the link, and I’ll add them to the list here. Good luck finding some players. Stumblers: Welcome, and I invite you to take a look around my site, there’s plenty of stuff for you here. You may want to check out this post to start! Plot hook of the day: A thief is found stabbed in a back alley with a list in his possession with the names of the party members scribbled on it, along with a map to a nearby cave complex. As part of the investigation, the constable questions the party accompanied by another guard. The next day, the constable himself is killed. What’s going on here? ← I knew Githzerai looked familiar. I found that conventions are a great way to meet people and most tabletop cons have boards so you could advertise your game. Ditto with the D&D game days. Also, there’s RPG groups on Meet-up.com which are about meeting new people specifically to get them to organize and form games elsewhere. You’re hitting on what I deem to be the biggest problem with D&D – finding players. I lucked out and now have two groups and some local opportunities. I’m lucky to have found a great group of friends from work and friends they know. We get together weekly and everyone has a blast. I also was found through Meetup to another group that’s also a good time. Lastly, my FLGs (two of them) have regular RPGA events so we get our weekend D&D fix there. Finding a group can be hard. When you find it, keep it healthy by bringing in enough people so if someone steps out, you have the spot filled. This means running six players most of the time, but its worth it to keep a group alive if someone has to leave. Really, finding a good group comes down to luck. I hate to say it, because its such a problem for D&D, but its the truth as far as I can tell. I was in that situation just recently. I was looking for people and having trouble finding them. The one guy I contacted from the bulletin board at my FLGS didn’t pan out. Ultimately, I did connect with a couple of good people from the Wizards forums (gleemax.com) and penandpapergames.com. I know this is an old post, but I was wondering if you had a solution to the OPPOSITE problem. We are a group of newbie players who have all been interested in playing D&D but never had people to play with. Now we have a group, but no DM-newbie or experienced. The last time I was involved in a P&PRPG, I was forced to be the GM, and while I am a good storyteller. It was the DFRPG and I am very familiar with the setting. Not being familiar with the D&D multiverse, I don’t feel comfortable running my own campaign. Well, someone’s gonna have to bite the bullet… or do a round robin thing where you take turns DMing… run one shot stories, perhaps not lined to a grander campaign…. eventually someone will want to DM a whole campaign. I have the exact opposite problem of you guys. I have a group of 4 ready to go, all of us new (I realise that can be a bit annoying, sorry). All of us really interested in DnD and wanting to really get immersed in it! We are all mid 20’s, so not looking to question or complain. Really I just wanna experience the likes of which I have been watching on Critical Role but unfortunately didn’t grow up knowing about DnD until now. Any new comments go to my email so please message me if you’re interested! Great job on this post! Wish I had stumbled across it earlier! This is a problem I had run into for a good minute. I was wanting to DM a game, and I had one friend who was willing to play. However, one man and a DM don’t make a party. We were pretty lucky however, as we knew people in our personal life that were almost as nerdy as we were and were able to get a group together to play. The most difficult part for us was scheduling a time so that everyone could participate. Everyone’s work schedule, including mine, was hectic. But we eventually were able to find the time and now we have weekly games. I Co-DM for my buddy, and we’re all having a pretty great time.